Paul Stevenson is, in many ways, your typical "Kiwi bloke." He played Rugby into his forties, as well as playing cricket and basketball. He ran the New York marathon and enjoys cycling. Having begun to suffer from joint problems, Paul started to include Nordic Walking into his exercise regime. 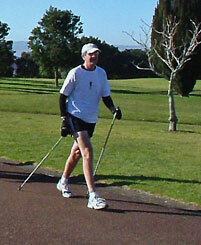 During the 2006 Rotorua Marathon, Paul just missed the 5hr 40min Nordic walking world record by 2 minutes. A great effort considering he was still recovering from the grueling Oxfam 100 km walk. Paul injured his back in January due to a cycling accident, so his marathon training had been restricted. However, Nordic walking, by giving him a more aligned posture and engaging the arm, chest and abdominal muscles as well as the legs, meant there was less pounding on the joints and alleviated the pressure on the trouble-some back. It's the morning of the Rotorua Marathon and it's pouring with rain. Runners and walkers are wearing a great array of waterproofing - from Gortex rain jackets to rubbish bags with holes for the arms - but people are already soaked. And the race has yet to start. Not the best conditions for an attempt on the world record for Nordic Walking a marathon. Paul decides that there is nothing to lose and if he is able to maintain the record-breaking schedule, he might get warm enough to dry out a little. It is crowded for the first kilometer around the Rotorua CBD and Paul has to skirt other walkers to get clear. Through Ngongataha, it is still raining heavily but Paul is surprised at the 10km mark to see he is on schedule. His back is feeling good and he likes the way that the 'Exel' Nordic poles help to get through the infamous "hills at the back of the Lake." Through Hamurana, the rain eases and eventually stops. At the 20km mark the sun is coming through and the rain jacket needs to come off. He is passing a number of walkers, including some race walkers and starting the catch the walk/joggers at the rear of the runners. At 30km, he is starting to feel the lack of training, but with a few jellybeans washed down with 'Replace', maintains the schedule. Tempted to ease off and enjoy what is now a sunny afternoon, he imagines how annoyed he will be if he misses the record again by a few minutes. He pushes on. Through Te Ngai Road and the 40km mark, Paul concentrates on getting the most out of the Nordic Walking technique, extending his arms and lengthening his stride. Entering the Government Gardens through Princess Gate, he can't quite see the race clock on the finish gantry so simply puts his head down and goes for it. Only marathoners can understand the joy of seeing the finish line, knowing that 42.2kms has been completed. The psychological and physical battle has been won and you can stop moving. .
Did I mention the time? A new Nordic Walking world record of 5hr 37 mins. Held by a typical Kiwi bloke.